Staff and volunteers at Re:store Northampton. (Pictured L-R) Hannah Osbourne, Helen Croxon, Emma Cousland and Kay Jones. A food bank in the heart of Northampton town centre is having to purchase extra food to meet the high demands for parcels after a rise in referrals. Re:store Northampton is a charity run by Central Vineyard Church, in Sheep Street, to serve those most in need within our town. Every week charity staff host projects, which range from crisis support - providing food and necessities to those living in poverty - to longer-term support work in the form of educational workshops and emotional and practical support. 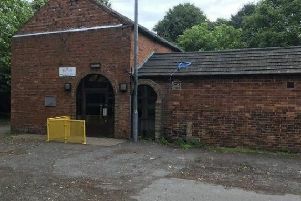 But now, the food bank, which saw an influx of donations around Harvest Festival time, is desperately appealing for more donations as it is extremely low on stock, and some items have completely run out. Occupational therapist Hannah Osbourne of Re:store Northampton thanked previous donators but said the charity, now more than ever, needs help. "Whilst in previous years this food has kept the food bank well stocked for many months. “Due to the increase in referals to the food bank we are finding this food isn’t lasting as long as we had hoped, and as a result, our store is currently very low of food stock. "Some items we have run completely out of and Re:store is finding more frequently that we are having to purchase extra food to meet the high demands for food parcels." Bosses say the items the charity is most in need of is tinned hotdogs, men's deodorant, rice pudding, biscuits, rice, pasta and pasta sauces. As well as giving out food parcels, volunteers and staff also cook-up a hot lunchtime meal for those who cannot afford to buy one. She added: "It is of great concern that reports continue to show that there are thousands of vulnerable people within the borough of Northampton requiring support - figures that are borne out by our own experience. The people who access the service may also suffer from a multitude of other issues, which are often related, such as fuel poverty, debt, homelessness, addictions, criminal behaviour, mental health issues and poor physical health. "We offer people a hand-up rather than just a handout, by equipping individuals and families with skills for independent living, often providing additional support, which statutory services cannot. "Issues such as changes to Universal Credit and the resulting difficulties have meant that people who have not previously accessed our services now have need to do so, thereby increasing the importance of Re:store and its work. “It is a sad fact that 65 per cent of families in the county are one paycheck away from financial crisis, particularly at a time where food prices are increasing."